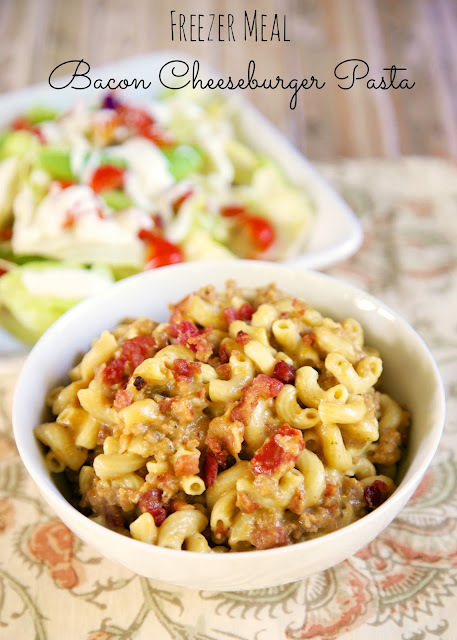 We are continuing our freezer meal series! If you missed the previous freezer meals, you can check them out here: Day One, Day Two, Day Three, Day Four, Day Five. 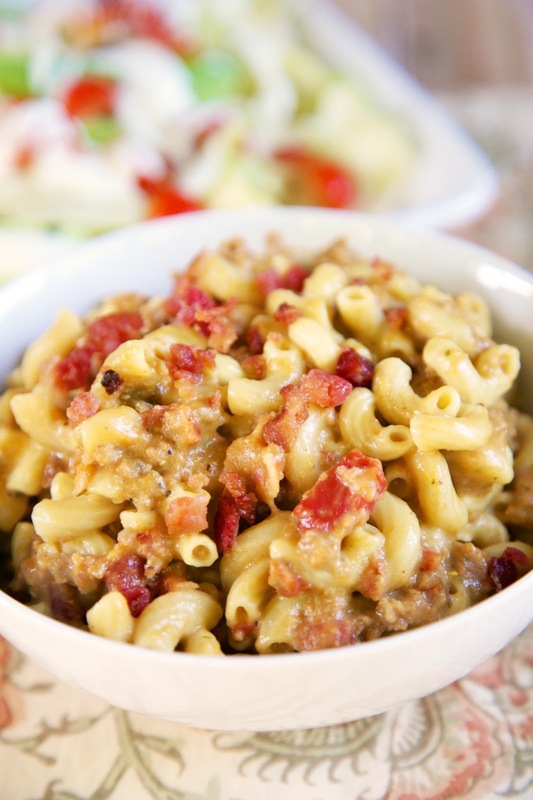 We were huge fans of this Bacon Cheeseburger Pasta. It had so much flavor and really filled us up. As with the Garlic Parmesan Pizza Pasta, you don't precook the hamburger meat before adding it to the freezer bag. It cooks all day in the slow cooker. It sounds crazy, but it works! I used some precooked bacon for this freezer meal. I always have some in the freezer and it saves a ton of time. The pasta is added when you get home and takes about 15 minutes to cook. We served this with a salad for a super quick dinner. Place ground beef, bacon, onions, mustard, soup, Rotel, beef broth and cheese in a gallon size ziplock freezer bag. Freeze. When ready to cook: Place contents of gallon sized freezer bag into slow cooker. Cook on LOW for 6 hours. Break up meat with spatula. Add uncooked pasta. Cook for 15-20 minutes longer, until pasta is cooked. This looks delicious and it's a one pot meal to boot. I need to try these freezer meals for during the week. This is a good one to start, making it today for Thursday. Do you thaw it before putting it in the slow cooker or just put it in frozen? When do you add the bacon? Its not in the body of the recipe, though I see that you used pre-cooked. Does it get frozen with the rest of the meal, or added at the end of the cooking? Hi I just wanted you to know me and my small group from church had a freezer meal party and made all your recipes and we are loving all of them! Thank you it was so fun to do together and the meals are all delicious! The pasta is added to the slow cooker uncooked. It will cook in the bacon cheeseburger mixture. Mine took about 15-20 minutes to cook. You don't need to add water - the beef broth and soup give the mixture enough liquid to cook the pasta. Hi! I'm looking forward to trying your freezer meals...quick question though. By the time I leave in the morning and return home, I'm sometimes gone for 11-12 hours and that is too long for a crockpot. Ideas on preparing your meals in the oven or stovetop?